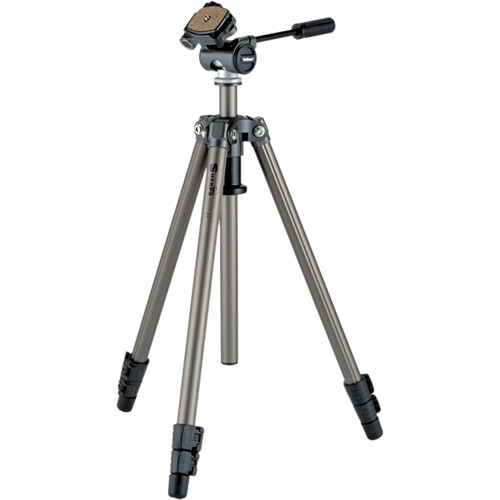 This Sherpa 200R Tripod with PH-157Q 3-Way, Pan-and-Tilt Head from Velbon supports up to 8.8 lb, measures 24.4" when folded, and includes a quick release plate. Its 3-section legs each feature flip locks for fast deployment, and can be positioned for a minimum height of 23.5" to a maximum height of 53.0", or 65.9" with its push-and-pull, rapid center column fully raised. To further enhance stability on a wide variety of surfaces, each leg includes a rubber foot. Box Dimensions (LxWxH) 27.9 x 5.6 x 5.6"
Sherpa 200R Tripod with PH-157Q 3-Way, Pan-and-Tilt Head is rated 4.7 out of 5 by 3. Rated 4 out of 5 by Yoga Lab from Rank amateur says: it's great It's the only tripod I've ever had but I'm thoroughly pleased. I guessed that the very inexpensive tripods would be less awesome. I don't know but my Canon 3ti sits very securely. The clamps for the telescoping legs seem appropriately engineered, not too flimsy, not overkill. Rubber feet are great. The panning motion is smooth. No carrying case, though. But I'm very happy with the tripod. Rated 5 out of 5 by Michael J. from Great Buy I use the tripod to anchor medium range (up to 300 mm. )telephotos and landscape lenses. It is an improvement over it's Velbon predecessor. It is more solid and works well. Leg locks have been improved. On the negative side,the head tightening mechanism requires a fair amount of torque to snug up the side-to-side rotation. It is a great tripod for the money. Rated 5 out of 5 by Mr. Haire from Good for young photographers I use this tripod in my middle school photography/video class. It is sturdy and durable with few moving parts. Not much that kids can break. They have held up for many years with students who are learning how to use a tripod. Great product. I bought 15 of them! A ball head such as the Slik SBH-120 DQ Compact Ballhead 120 with Quick Release - Supports 4.5 lbs (2kg) B&amp;H # SLBH120DQ can fit the 1/4 thread on the base of this tripod. Yes, the Velbon QHD-63Q Ball Head with Quick-Release Plate could also be used.